Lesley's Girls- Vintage Lifestyle and Fashion Blog: Button. Button. Who's got the button? Button. Button. Who's got the button? Our Dad hates buttons. But my luckily for us he is alone in his button hatred in our family because between Susannah and I we have established a veritable treasure trove of buttons from different times... 1900's right through to the 1980s and beyond. I think we both agree that as children looking through our Grandma's or our mother's button box was a real treat- almost like sorting through precious stones (well it seemed that way at 7 years old). We were either sorting them, making pictures with them, piling them or counting them- hours of fun (we must have been angelic or easily pleased!) Nowadays the sight of a box of buttons (particularly vintage ones) provides just as much excitement but for completely different reasons. As regular readers are aware we are opening up Lesley's Girls Upcycled this Spring, this is because we had a huge range of vintage items which either were beyond repair or we felt could be used for slightly different purposes than they were intended- the buttons fall in to this category. We spent hours picking through buttons to choose ones which were charming, interesting or beautiful that we could put to use. So far we have created a selection of bobby hair pins with these and we thought we'd share some preview pictures of a selections of these now. We are in the process of creating a range of button jewellery as well. I loved my mom's button box, and my grandma's, too. My mom's button box was a very vintage purse with a broken handle. We used to play "hide the buttons," which we thought was great fun. 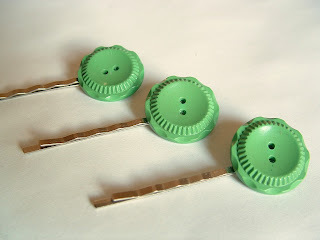 Seeing your upcycled button bobby pins makes me think I should make a button hair clip. my daughter (ok, and son, too) loves playing in my button box...many are from my grandmothers who she will only know from stories...i still love going through them too...the new shop sounds wonderful...love those bobby pins. My mother kept her buttons in a Valentine's candy box!! I loved sorting and counting and making designs with them while she sewed! Lovely memories. Good luck with your new shop and thanks for stopping by my blog -- followed you too!! Really cute! Buttons are truly treasures. I've always loved sorting through them and matching up the sets.